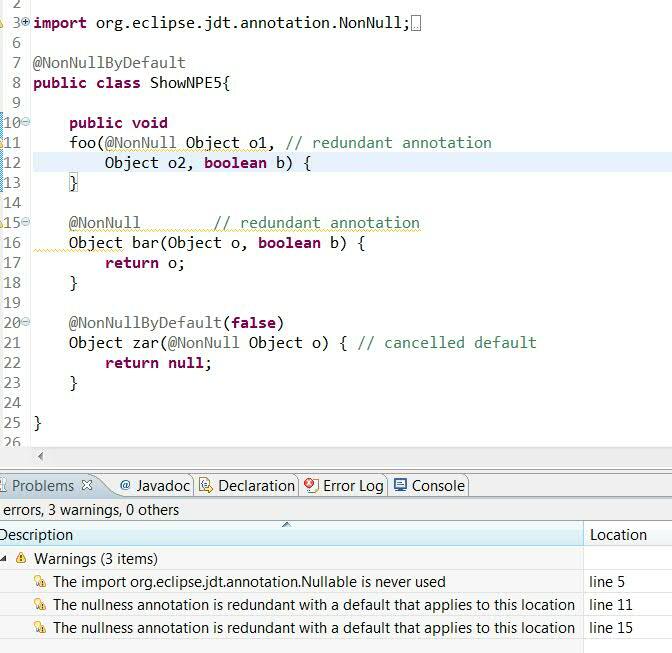 Eclipse, Java and all that JAZZ! 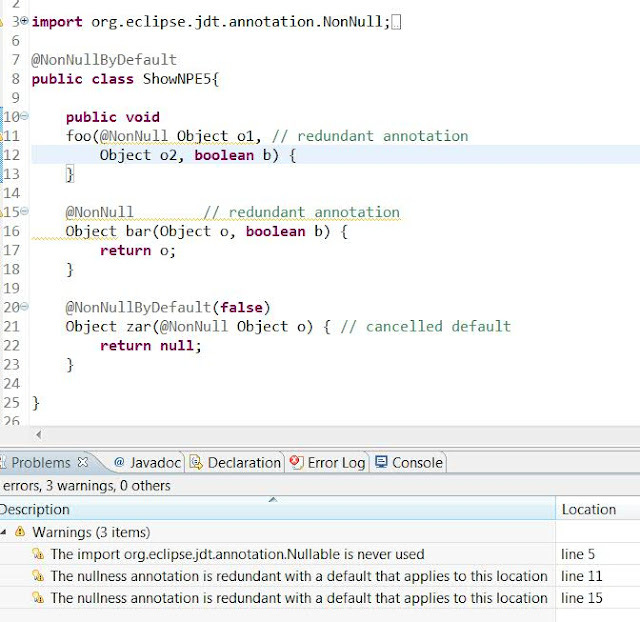 This blog is about the open world of Eclipse, Jazz and related technologies. Its about new stuff coming your way, old stuff you didn't know existed or simply stuff that we talk about as we enter a new era in software development. All this, straight from the horse's mouth! 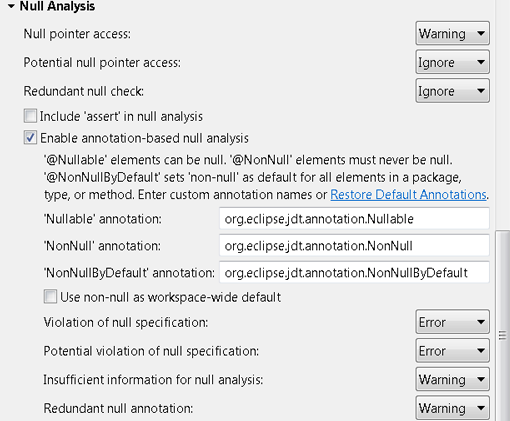 What is JDT's annotation based null analysis? 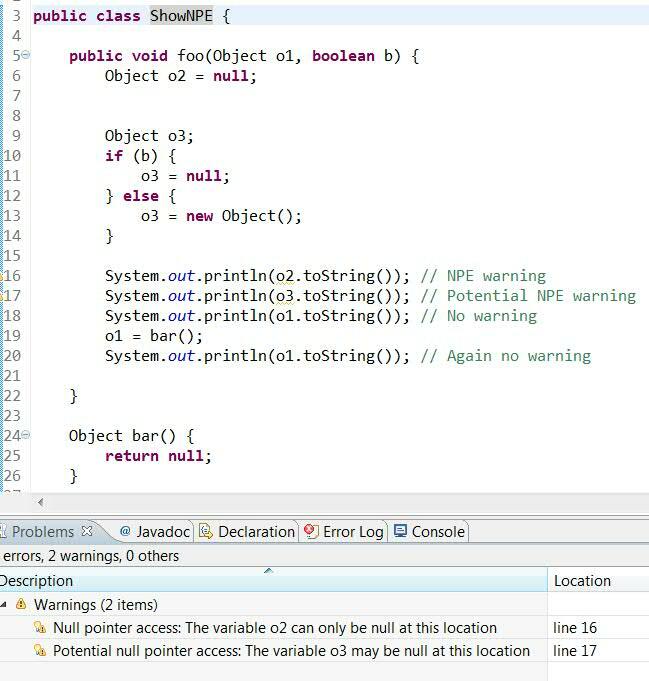 To give a bit of a background, you must've noticed that JDT java compiler does some static analysis and based on that warns if you deference a variable that has been analysed to be (potentially) null at runtime, or compare a variable against null when its nullness at runtime can be determined at compile time. However, the warnings are only generated for local variables inside a method. There's no way to find out the change of nullness due to a method call, or for parameters of a method. Consider the example on the left. o1 is a parameter and since we don't know how foo(..) will be called and what value will be passed to o1, we can't do any analysis on it unless its state definitely changes inside foo(..). Also note that even though o1 is assigned return value of method bar(), which returns null, the compiler cannot figure that out during static analysis and assumes the return value of bar() to be an unknown value. Null annotations offer a solution here. They are a way of enforcing null contracts in your code to make sure you catch such (potential) NPE's before they occur at runtime and become a stop-ship bug for your product. How do I use null annotations? when this annotation occurs on a return type, it enforces a non null return value for a method. 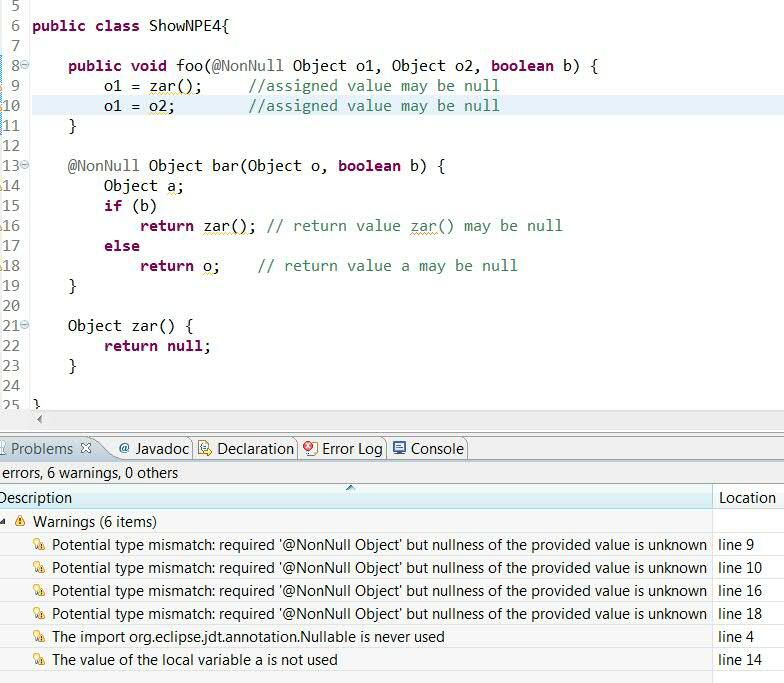 when this annotation occurs on a method parameter, it enforces a non null value to be passed to the method call and that only a non null value can be assigned to this parameter inside the method. when this annotation occurs on a method return type or parameter, it says that the returned value can be null, and so can be the argument. This can be applied to a package (in package-info.java), class or method to enforce nullability for all enclosed elements. The annotation alone enforces non nullability of enclosed method return value and parameter values. If applied with a an argument i.e. NonNullBeDefault (false), it will cancel out any global default for the particular element. One can also use their own annotation types as null annotations. Just make sure they are on the project's buildpath. 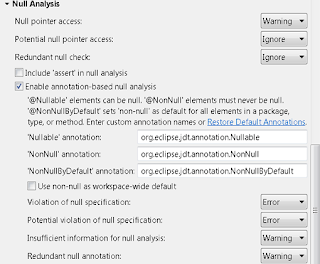 To enable null annotation based analysis and specify the annotation names, navigate to Preferences>Java>Compiler>Errors/Warning>Null analysis. What new errors/warnings should I expect to see with null annotations enabled? As seen in the above dialog, there are two kind of diagnostics of primary importance - violation of null specification and potential violation of null specification. In addition to these the existing null analysis gets enhanced, and now for annotated method parameters a null state is available inside a method. 2. You assign a @NonNull annotated parameter a null value. 4. You inherit a method annotated with @NonNull but now loosen the contract by annotating child method as @Nullable. 5. 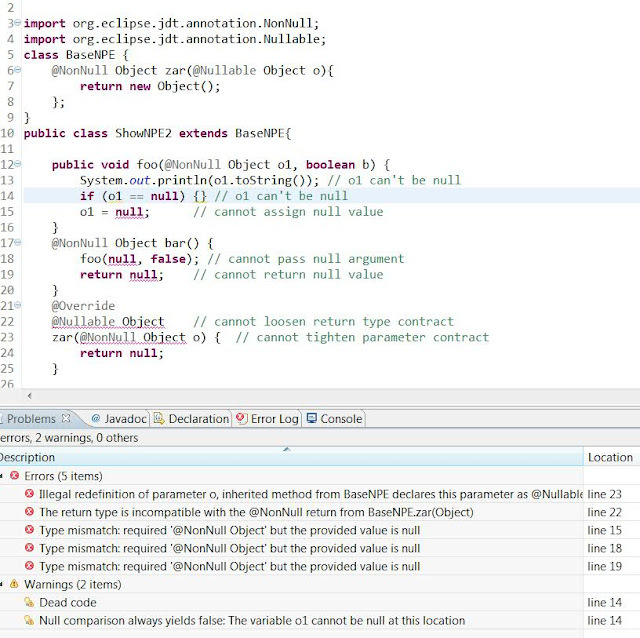 You inherit a method with a parameter annotated with @Null but now tighten the contract by annotating child method's corresponding parameter as @NonNull. 2. You assign a @NonNull annotated parameter a value ascertained to be null on some execution path. 3. You return a possibly null value in a method that is annotated with @NonNull. 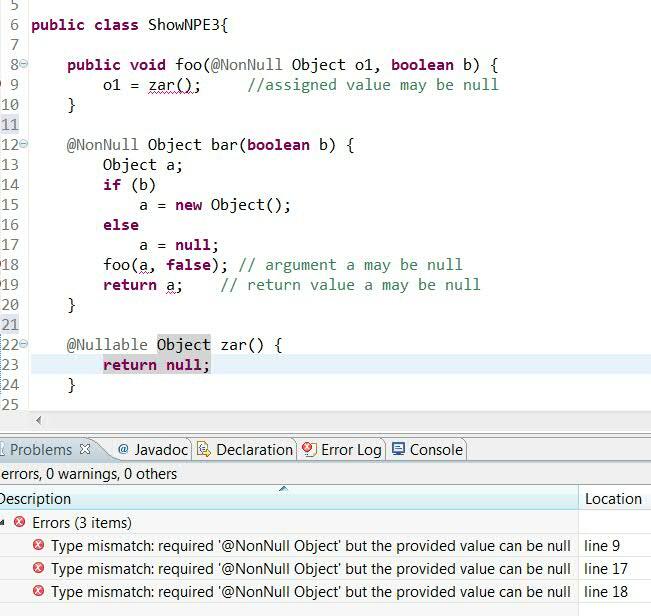 Insufficient null info is issued when there's not sufficient information to evaluate a given value to be (possibly) null and that value is passed as an argument, assigned to a parameter or returned from a method. Redundant null annotation is issued when an annotation has the same effect as one applied already in an enclosing element. Note that this is a work in progress and we will continue to polish the same for the Juno release. We're also working on ways to help people use this functionality easily (eg. : Support for nullity profiles for libraries and Quick fixes for null annotations. ) . For a sneak preview of this feature, drop in at the EclipseCon 2012 tutorial - How To Train the JDT Dragon. If you find any issues while testing this feature, please open a bug. I hope you're as excited as we are about this cool new feature! What about showing these annotations in Javadoc views and autocomplete parameter tooltips? We're working on the UI for the new feature and most of the support should be out by M5. Thanks! @denniswhite, sorry I didn't quite get you. What exactly do you want to see? I, Ayushman Jain, work at IBM India Software Labs, Bangalore, India. 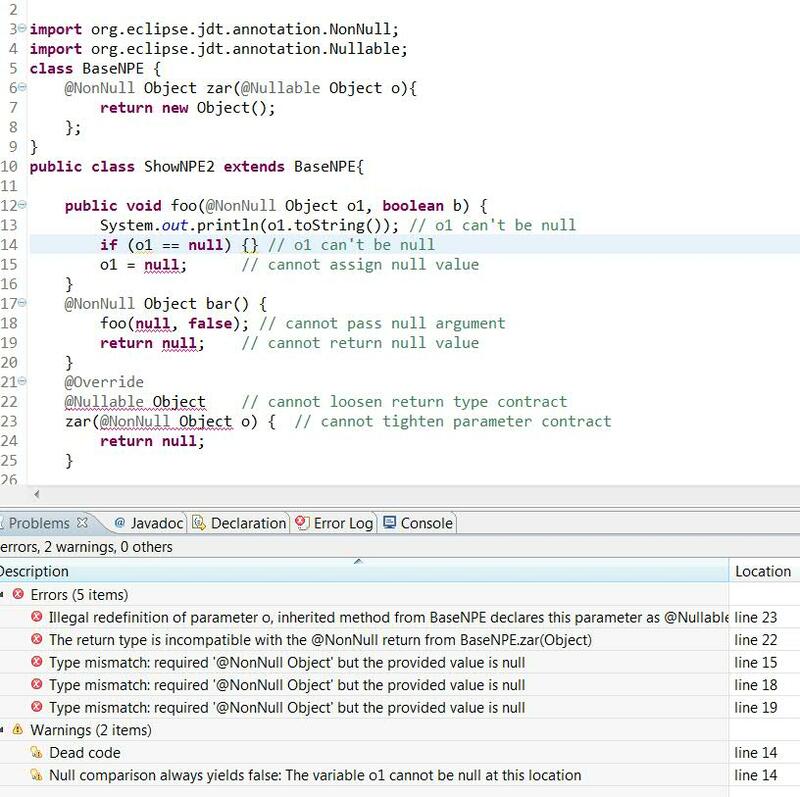 I'm a committer in the Eclipse JDT/Core and e4 projects. The postings on this site are my own and don’t necessarily represent IBM’s positions, strategies or opinions. I've learned that life is like a roll of toilet paper..The closer it gets to the end, the faster it goes. I've learned...that we should be glad God doesn't give us everything we ask for. I've learned...that money doesn't buy class. I've learned...that it's those small daily happenings that make life so spectacular. All eclipse based content, images and code are copyrighted under the EPL v1.0. Picture Window theme. Theme images by sololos. Powered by Blogger.